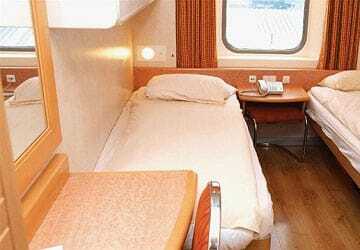 The latest addition to the Brittany Ferries fleet, Cap Finistère feels like a "boutique hotel". 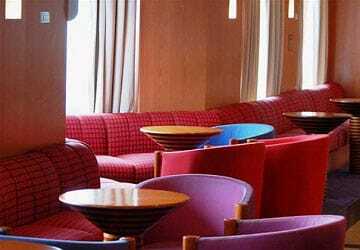 It has an intimate, less formal ambience than the their flag ship Pont-Aven, whilst retaining a sense of space and comfort. 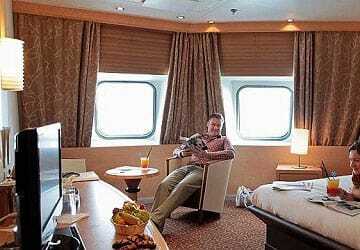 Having had over $15 million spent on this vessel recently, it now provides an extremely comfortable experience. 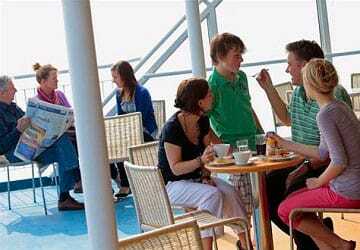 Onboard there are relaxed dining areas, outdoor decks and cafés, degustation sessions with experts, even make-overs and massage sessions: All with the usual superlative Brittany Ferries service. 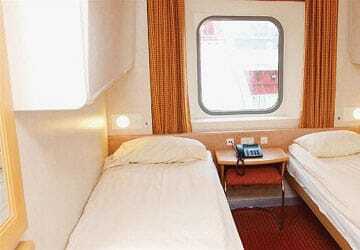 Cap Finistère features numerous cabins, all of which are en-suite and air conditioned. 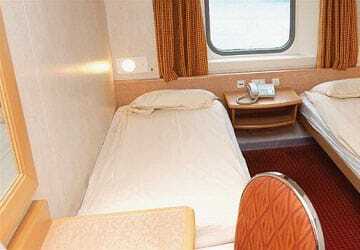 There are also a number of cabins adapted for disabled passengers. Soap and shower gel are also provided in case you want to freshen up and you'll also find at least 1 plug socket to use or to charge any electrical appliances that you may have. Seats cannot be pre-booked on this ship. 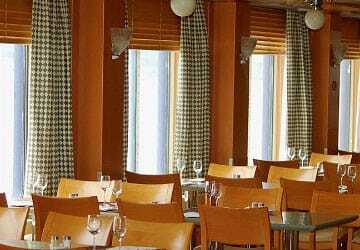 With its intimate atmosphere, Cap Finistère's main restaurant, Le Café du Port has seating which runs either side of the ship. Diners can choose from two to four courses all served at your table and all at great value prices. To accompany your meal, there’s a superb choice of great value French wines - simply ask your waiter or waitress for any suggestions. Located on the outside top deck, next to the pool, the Blue Marine café offers a selection of self-service snacks, including pizzas, pasta, burgers and salads. Due to its location, this café may be closed during bad weather and during low season. Located near the main restaurant, Le Petit Marché is ideal for passengers wishing to have a snack rather than a full meal and offers a range of sandwiches, snacks and cakes, plus some healthy options. 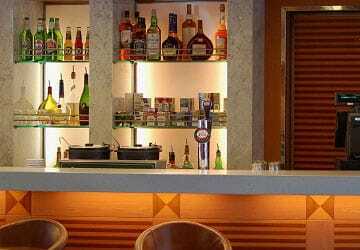 Situated at the back of the ship, the main lounge bar ‘Planets Bar’ serves everything from the finest French wines to cocktails. Also on the menu are hot and cold drinks and snacks. 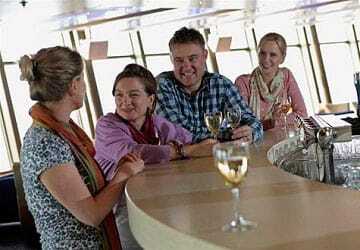 With a mezzanine-style seating area reached by a sweeping staircase, the bar offers a real cruise ship feel with plenty of space to get together with friends, or simply find a quiet spot by the window. 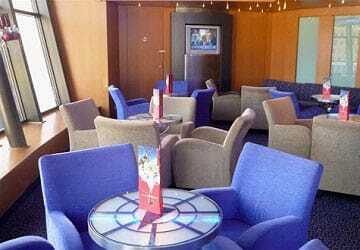 Located outside at the back of the ship on the top deck next to the sun deck, the Cap Finistère's unique Belle View Bar offers passengers a perfect setting to relax and watch the world go by. Due to its location, this bar may be closed during bad weather and during low season. Boutiques can be found on deck 7 and feature a fine range of spirits, wine, tobacco, perfumes & cosmetics, leather goods, confectionery, toys, fashion, decoration, souvenirs, newspapers, games, cameras, sunglasses, jewellery. Purchases made on board may be paid for in Euros or Sterling. Payment can be made in cash, by credit or debit card. Prices are shown in both currencies and you can combine different payment methods. The magnificent outdoor pool area offers guests the perfect opportunity to unwind. Relax on a sun chair, sip a drink from the bar, or take a dip in the pool that offers great sea-views. Cap Finistère features plenty of deck space so you can stretch your legs and and enjoy a calm spot to relax, while enjoying the sea air and incredible views, particularly when entering or leaving the port. 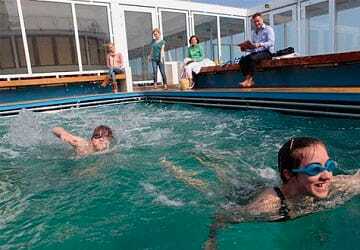 Recently introduced on Cap Finistère is a dog exercise area located on deck 10. 'Wi-Fi time' can be purchased from the information desk. 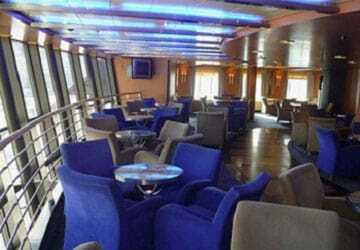 There is a cinema onboard where you can catch some of the latest films. There is also a cash machine dispensing euros, and a baggage room to store your luggage. 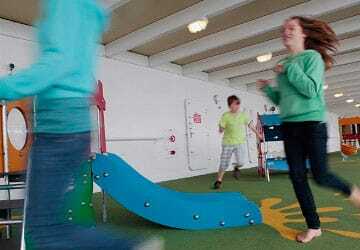 Young children can enjoy fun and games in the playroom on deck 10. There are specially adapted cabins for disabled passenger use, there are disabled toilets throughout and all decks are accessible by elevators. Please Note: Whilst we have taken great care in making our Cap Finistère guide as accurate as possible, onboard facilities, services and entertainment may vary depending on the date and time of year that you travel, facilities mentioned may change without notification and ferry companies reserve the right to operate vessels other than those mentioned at time of booking without prior notification. Journey to Bilbao on Spanish toll road very simple - not too much traffic and good roads all the way to the port. Cap Finistere was well prepared, well equipped and had a helpful staff on our Bilbao - Portsmouth journey. "a travelling H. O G. "
Boarding. Was straight forward and easy ,,the cabin was clean and comfortable , the staff on board were friendly and helpful , there was some very attractive french ladies working in the restaurants ,,viva france ! A good selection of food and choice ! Will travel again ! 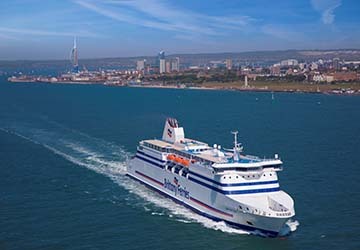 "Another fab trip to Spain on Brittany ferries "
We have done the 24 hour crossing from Portsmouth to Santander twice now and it is a great way to start the holiday. We take our motor home and the crossing gives us a 24hr reprieve from driving. The facilities have been excellent each time and service great. The cabins are nice and comfortable and food in the al a Carte restaurant is as good as many top restaurants we have visited. Staff very attentive and A good price for a 3 course meal. First time on an over night ferry. We loved it. This was the first time that my wife and I had experienced a long ferry trip (only been to France before). The check-in was very stress-free, unlike airports! and the journey out was very smooth. 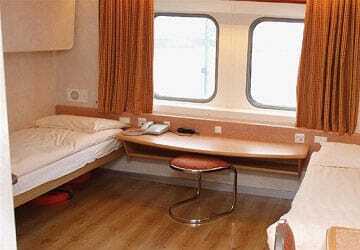 Even though we were on what was classed as an "Economy" boat, the cabin was very comfortable and relaxing during the voyage was very easy. The duty free shop was very good value and we could pay in sterling as well. The journey back was on a much larger boat, the Cap Finistere; if you can, opt for this one - real cut above the economy boat on the way out. The food in the restaurant was superb and the service also. Again a smooth trip back and easy boarding and disembarkation. I would recommend this way to travel over an airline, if you have the time. 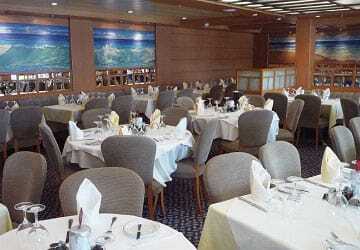 This was a good voyage - I was travelling with friends so no lack of company for dinner or during the day. I had a cabin to myself, very comfortable too. Comfortable cabin. Great dinner in the main restaurant. Very helpful crew. "Great as ever....and we saw whales"
Great trip....great staff.....saw some whales which made it even better. See you next year. Excellent crossing both ways. We ate in the restaurant on each journey and it was excellent. Sandwiches in Le Petit Marche not so good. Return to vehicle was chaotic we queued for time on the stairs could be better organised to avoid this. "General on passage Bilbao to Portsmouth on Cap de Finistaire"
"Portsmouth to Santander and return"
"A love of boats "
We loved our trip despite the fact that acedently booked bunk beds and at 71 years was glad I was fit enough to climb. Seeing the dolphins was amazing. Found the whole experience from loading to disembarkation on both vessels wholly satisfactory. The catering facilities in particular are worthy of mention, the meal I had in the Al a Carte restaurant on Cap Finistère was one of the best of the whole 2 week holiday in Spain. The staff were also very efficient and friendly.